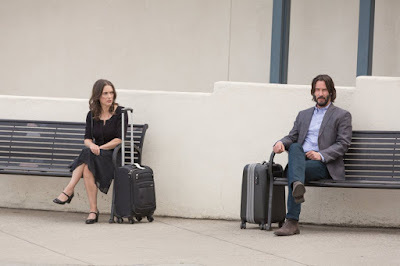 Midway through “Destination Wedding”, Frank (Keanu Reeves) and Lindsay (Winona Ryder), the anti-social duo destined to fall in love, or something like it, have returned to their hotel after the eponymous ceremony. They are lying in bed. He explains how, borrowing the Greek Mythology’s Flaws of Aphrodite and revising it, Lindsay possesses “the folds of Aphrodite”, which he defines as the graceful way “the cheeks of beautiful women arrange themselves when they smile.” It is not objectification. Even if “Destination Wedding” attempts to turn these two into genuine characters through conversation in which they harangue each other about their wants and needs and what they hate and what they really hate, Keanu’s robotic intonations and Winona’s Emmy-Reacting-GIF of a performance make it virtually impossible to distinguish them as Frank and Lindsay. And that’s okay. That’s why we’re here, to get lost in their movie stardom, and Keanu is simply speaking for all of us when he compliments Winona’s cheekbones. That makes it a little unfortunate, then, that director Victor Levin, who also wrote the screenplay, almost completely forgoes fawning close-ups. I mean, really? No, his preferred style is either medium or long shots of both actors, the camera peering at them from between rows of winery barrels or from afar as they sit side-by-side in massage chairs or through various wedding guests as they sit in the back row and cast judgment on all those around them. The only times Levin does cut closer is usually in the midst of one of Frank and Lindsay’s long-running conversations and only for a second, lingering not on the respective actor’s features but their instant reactions. It’s disappointing even if it makes sense. After all, this movie is just them, never allowing us to hear from any other characters, not the bride or the groom, not even the guy on the curb at the end when Frank asks him a question, the latter seeming to be Levin deliberately underlining at the last second his whole movie was just supposed to be Frank and Lindsay (Keanu and Winona). It’s a good thing that it’s them, frankly, because Frank and Lindsay are fairly disagreeable if not downright irritating people. The movie is subtitled “A Narcissist Can’t Die Because Then the Entire World Would End” for a reason. They are self-involved and, per romantic comedy tradition, at odds immediately. But then, that self-involvement is, in its own way, what draws them together. Given that the entire movie is a running conversation between two people in a scenic locale, Cinema Romantico is obligated to drop a “Before Sunrise” comparison. And that is true, so long as you sub out Ethan Hawke and Julie Delpy for, like, I dunno, Jack Nicholson in “As Good As It Gets” and Joan Allen in “The Upside of Anger.” These two are so insufferable that there is no one else on Earth, most likely, properly suited for them. Narcissists deserve love too, in other words, which is essentially what “Destination Wedding” boils down to, so long as you are lending credence to all the philosophical, or thereabouts, ideas they are espousing, which, honestly, you maybe don’t even need to do to accept their own version of love anyway. At one point Frank chastises Lindsay for complaining about her lot in life, explaining that this is what the 99% detests about the 1%, even if Frank and Lindsay are not, technically, the 1%. He and she have problems, yes, and they are right to, that’s okay, but they should, he implores, suffer silently and get on with it. No one wants to hear, in other words, about the problems of beautiful people. True, though they don’t tend to mind looking at beautiful people just be beautiful which is why we have movies and movie stars in the first place. Silents are virtually extinct, but while “Destination Wedding” could use two dozen more close-ups, and it’s not really a movie about snappy editing, you could still watch with earplugs and come away content.